It is always good to be able to dig up my old archive to share with you guys. During the time I started this lovely blog of mine, I was in my term holidays. That was went I did lots of baking and cooking, and sharing it here. Now that time does not allow me to do so, I have continued religiously drooled over many food blogs out there. So, about digging into my archives, I usually cook, take picture and then store it in a folder in my computer along with the recipe. So far, I just notice this folder getting much larger than other picture folders I have. There was this local food forum that I joined, named Jo’s Deli Bakery. Then there was once we made a meet up along with fellow Malaysians from the forum Kitchen Capers, that I always talked about. At the party, obviously a food party, everyone is to make something to bring there. Like how we local like to call it potluck. Then a lovely forum member made a wonderful chocolate cheese cake, which got everyone hooked and craving for one. So naturally, we demanded for the recipe and then forth started the phase, we called it, the CCC craze. If you keep drooling over various chocolate cheesecakes from the same recipe, and keep on hearing people rave about it day in day out in the forum, there is only one natural course of action. Yes, you make one too, not just to answer the craving since the gathering day but also to see what is all the fuss about. And I have to say, it is all worth the fuss! It is fairly easy to do, and simply delicious. It is hard for me to describe how good, you go try it and you tell me! This might even start a CCC craze in the blogosphere, who knows, as it is really tempting and the result is going to be an expanded waistline with a wide smile. Alright let us now see what the fuss is all about but be forewarned, it might start you into a phase. Making the mixtures was really easy, but layering them was the problem. When I poured in the final chocolate mixture onto the cheese layer, I made mistake by pouring too much in the middle, then end up scrapping it all to the side, which in the end causing the side rim to have too much. Nevertheless, the effect was not bad; I got wave-like layers, which some people thought I did it on purpose. I also found that I had to take longer baking time than suggested, then later I found out its because I used an 8-inch pan instead of 9. 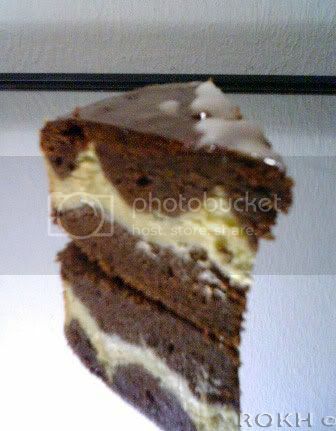 But I will still stick to 8-inch, because the height of the cake is just nice with the layers clearly shown, and of course, it means bigger portion in every slice. You won’t regret it.